Just over a month into its mission, NASA's Parker Solar Probe has returned first-light data from each of its four instrument suites. These early observations – while not yet examples of the key science observations Parker Solar Probe will take closer to the sun – show that each of the instruments is working well. The instruments work in tandem to measure the sun's electric and magnetic fields, particles from the sun and the solar wind, and capture images of the environment around the spacecraft. This image shows the first-light data from Parker Solar Probe's WISPR (Wide-field Imager for Solar Probe) instrument suite. The right side of this image—from WISPR's inner telescope—has a 40-degree field of view, with its right edge 58.5 degrees from the sun's center. The bright object slightly to the right of the image's center is Jupiter. 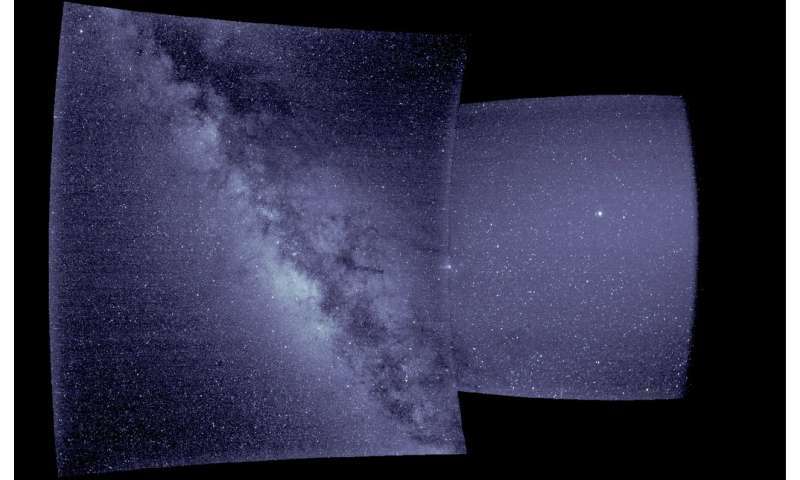 The left side of the image is from WISPR's outer telescope, which has a 58-degree field of view and extends to about 160 degrees from the sun. It shows the Milky Way, looking at the galactic center. There is a parallax of about 13 degrees in the apparent position of the sun as viewed from Earth and from Parker Solar Probe.